Looks like a normal email announcing some new interview he's doing right? Wrong. I haven't clicked on any of these links, but I know this is a survey in disguise. People don't fill out surveys. And when they do, they are not honest. If I sent you an email, would you rather get a survey that said, "when you choose a freelancer, do you:"
look for freelancers that have repeat clients? look for freelancers with proven experience? look for freelancers that you can pay on milestone basis? ask freelancers to sign an NDA? 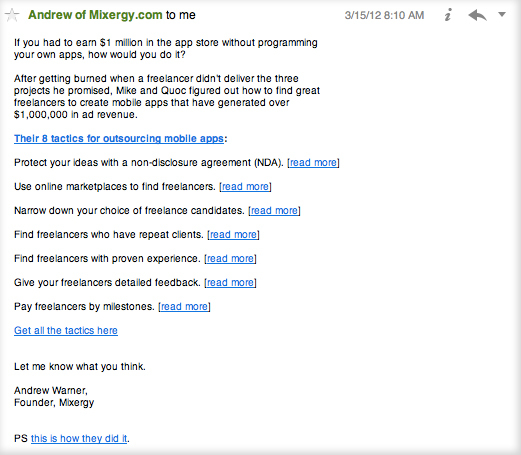 Or would you rather get an email like Andrew's above? Andrew is being smart about how he's testing subject headlines and finding out what the pain point of his audience really is. This is a good tactic and if you run any sort of business or consultancy, learn from this and do likewise.